Dave Harman had been a Wiltshire police cadet at the time Eddie Cochran was killed near Chippenham during April 1960. Harman accompanied the police to the scene of the accident and thus became witness to one of the greatest tragedies in Rock and Roll history. He had retrieved Eddie's undamaged guitar and had even taken it home 'to care for it' before it could be returned to Eddie's family. By the following year Dave Harman had formed his own group which became known as Dave Dee And The Bostons. Like many of the Merseybeat groups, the 'Bostons' learned their craft playing rock and roll in Hamburg, but graduated to touring with more established acts in the UK. For a time it seemed that opportunity was passing them by; even their first single releases failed to gain much record buyer response. It wasn't until the end of 1965 that they obtained a minor chart entry with their third attempt. At this time the 'beat boom' was in decline and 1966 was a poor year for most of the previously established beat groups. However, they distinguished themselves with a new 'sound' and a string of singles chart successes followed almost until the end of the decade. Sadly, Dave Dee and his mates only managed this one 45rpm EP release during their time at the top. Its focus is rather irreverant, but is quite in keeping with the cheeky humour that the band came to represent. Shortly after the release of their final chart entry as a five-piece, Dave Dee split from his friends. 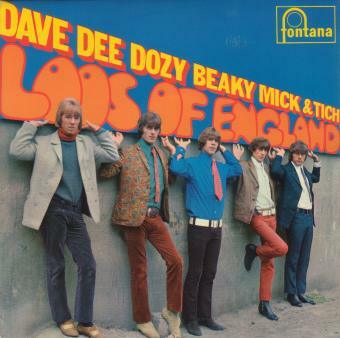 The abbreviated line-up; Dozy, Beaky, Mick And Tich soldiered on in the new form but without success. Sadly, Dave Dee's attempt to restart his career as a solo performer during 1970 was not a lot more fruitful with just one minor hit, and he eventually turned from singing to production.